This year marks my 11th Chuseok. My first one happened barely a month after I came to Korea. It was unforgettable as it was a new experience, but also stressful because I didn’t know what to do and I couldn’t understand Korean. Every celebration from that time has become a learning experience. So what happens during the Chuseok holiday? There are traditions that almost all Korean families do with slight variations from one family to another. Chuseok 2005 when we used to celebrate it at my parents-in-law’s house in the province ~ the men made songpyeon. A few weeks or days before the holiday, the men travel to their hometowns to cut the weeds and clean the graves of their ancestors. It is a whole day affair, depending on how many graves need to be cleaned. My husband and his brothers are in charge of this tradition called ë²Œì´ˆ (beolcho). The weekend before Chuseok is when the women start shopping for the food that will be served for the ancestral rite table, called ì°¨ë¡€ìƒ (cha-re-sang) in Korean. My family prefers to shop at the traditional market, especially at Gyeongdong Market. My eldest sister-in-law prepares some of the dishes at this time ~ beef rib stew (ê°ˆë¹„ì°œ), sweet rice drink (ì‹í˜œ), spiced ginger drink (ìˆ˜ì •ê³¼), water kimchi and side dishes for the meals. On the eve of Chuseok, we all move to our í°ì§‘ or the head house. In my family, that’s my eldest brother-in-law’s house. It used to be at my father-in-law’s house in the province but he thought it is more practical if we move the celebrations to Seoul. We all arrive at the head house early in the morning for breakfast. After the morning meal, that is when the real work begins. 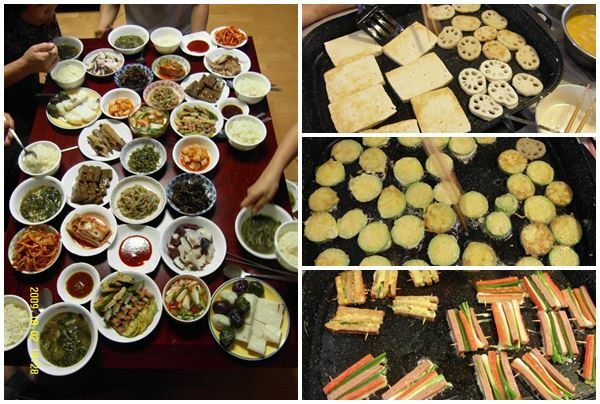 The women prepare the ì „ (jeon) or fried food ~ mixing the ingredients, shaping and then frying (takes three hours). The men in our family peel the chestnuts and then… watch TV! After the “jeons” are fried, we prepare the meals again for a late lunch. The men wash the dishes! And then they go back to watching TV while the women prefer to take short naps. Work begins again at around 5 o’clock for the 7 o’clock dinner. Dinner on the eve of Chuseok and the “jeon” we prepare. At 8 o’clock, we boil the eggs and the whole chicken (with head!). This is also the time that we pick up the traditional rice cake called ì†¡íŽ¸ (songpyeon) from the store. We used to make this until my sister-in-law discovered the rice cake store that sells really delicious “songpyeon”. Less work for us! At 9 o’clock, we would play some game like “yut nori” or “hwatu” while enjoying some fruits and an alcoholic beverage like “makgeolli”. We are off to bed at midnight. I get up early at 5 o’clock to take a shower and put on makeup before we all start working at 6 o’clock. While my sisters-in-law cook the three-colored side dishes (ì‹œê¸ˆì¹˜ or spinach, ê³ ì‚¬ë¦¬ or fern brake and bellflower roots or ë„ë¼ì§€), fish, steak and soup, I wipe clean the ì œê¸° (jegi) or the wooden dishes used for the ancestral rites and at this time and start arranging them. The food is stacked in 3 or 5 levels, never 4. They should also be arranged nicely and pleasing to the eyes. The men are in charge of taking the food and arranging them on the ancestral table. Top: Our Chuseok table in 2005. 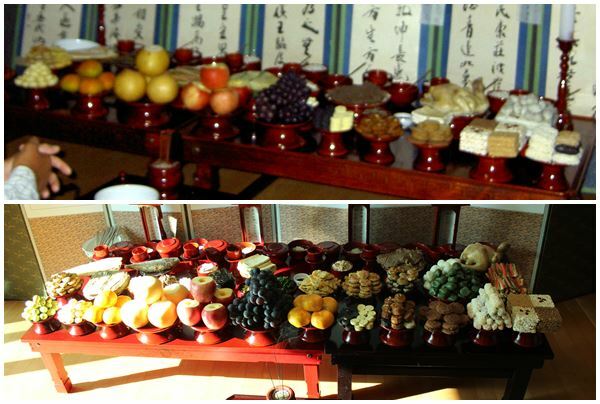 Bottom: Our Chuseok table in 2012. We start the ancestral rite at around 8 o’clock. While the men perform the first part of the ceremony, the women change clothes. We don’t wear “hanbok” during Chuseok. The men wear suits and the women could wear any decent clothes. The only thing we couldn’t wear are jeans and red-colored clothes. It is a must to wear socks or foot covering. The ancestral rite on Chuseok day. In my family, the women are given time to bow to the ancestors. In other families, the women are not allowed. Like I said, tradition varies from one family to another. When the ceremony is done, we drink the wine on an empty stomach! We usually have breakfast at around 9 o’clock. After eating, there is a ton of dishes to wash! Visitors start coming before lunch. And of course, the daughters-in-law don’t stop working until the last meal of the day. Then we’re off to our own houses. 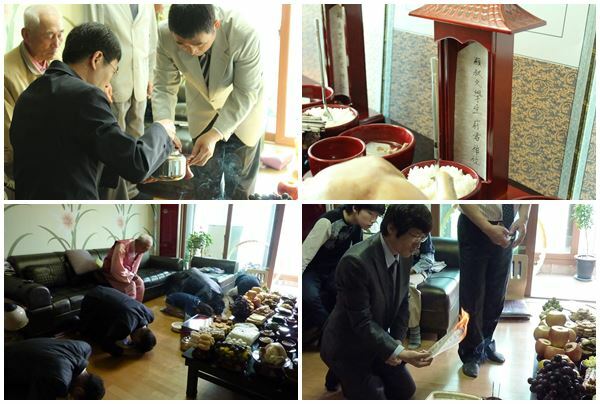 When our Chuseok was held in the province, we visited the ancestral graves right after lunch and bowed to our ancestors. This is the day when the daughters-in-law visit their families. Since I’m the only daughter-in-law whose family lives abroad, my parents-in-law stay with us until it’s time for them to go back to their hometown. Who spends for all the food? My husband and his brothers have a bank account that they save to every month for holidays and special occasions. My father-in-law also gives 300,000 won. How much money does “Chuseok” cost? That really depends, but my sister-in-law says we spend anywhere from 700,000 to 1 million won for the ancestral rite as well as for the meals. What happens to all the leftover food? There is always leftover food come Chuseok. We divide the food among us. How stressful really is Chuseok? In my experience, not as stressful as I thought it would be as I’m the youngest of three daughters-in-law. I already know my chores and I just try to enjoy this time with the family. It’s just once a year! What’s the best thing about Chuseok? The food and bonding with the family. I enjoy playing “hwatu” and I really like seeing my son enjoy his time with his cousins and uncles. What’s the worst thing about Chuseok? Getting up very early on Chuseok day and the fact that I have to wait four hours before I could eat breakfast! So that’s Chuseok for you! Have a wonderful celebration everyone! Do you still go to ancestors graves (province) even though you have shifted celebration of chuseok to soul? Thanks for the post. As usual – very interesting! Does your family read your blog? Chuseok sounds like a lot of work. But I would still like to spend it with my boyfriend’s family. This is third year in a row he’s having Chuseok without me in Korea and I’m in Europe. 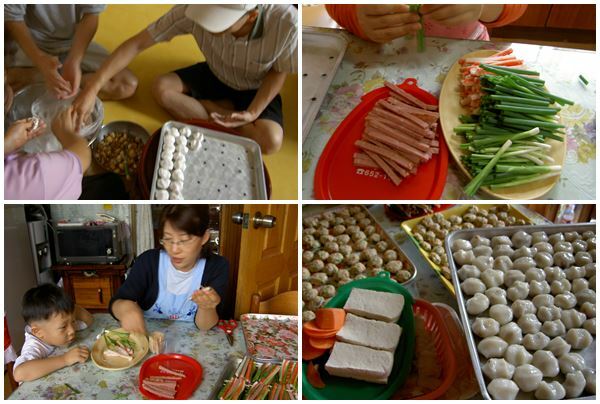 Nice, very lovely post about family bonding and for telling the pros and cons of â€œChuseokâ€ . While reading your post, I feel hungry looking at the pic of your food for dinner. Sigh, wish I can try it too. Anyway Thanks for the lovely post Mabuhay!